A strange thing happened to Manchester Orchestra in the past few years: They became human. The band, led by millennial wunderkind Andy Hull, had been on a rise as meteoric as they come to upstart emo bands. The group landed a major label deal, the cover of Alternative Press and the fandom of Jesse Lacey, whose band, Brand New, took Manchester out repeatedly, gifting them a fanbase as rabid as any in rock and roll. Of course, all the buzz in the world wouldn’t matter if the songs didn’t deliver, and deliver they did: 2009’s Mean Everything To Nothing was the new generation’s answer to Pinkerton, with the 2011 follow-up Simple Math serving as the best Built To Spill album Doug Martsch never wrote. Each record earned stacks of accolades, all of which were deserved. 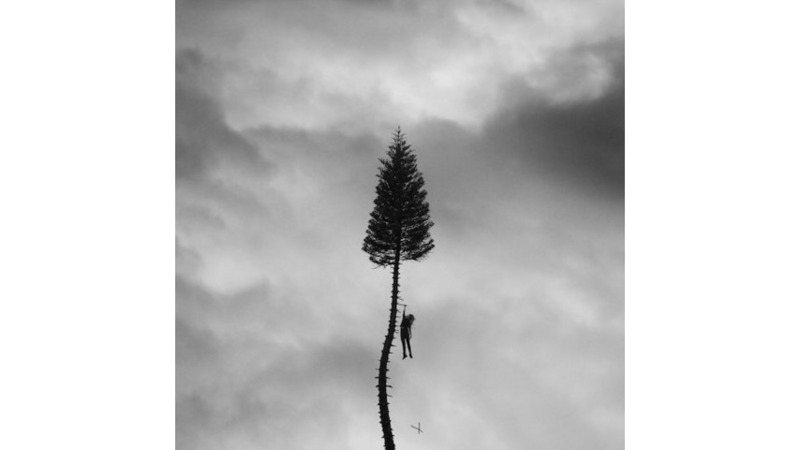 But then, Manchester Orchestra released Cope in 2014. It was the first Manchester album to feature a retooled lineup missing original bassist Jonathan Corley, and it was also the first Manchester album to simply be really good—a fine compliment, sure, but coming off of two legitimate five-star albums, it was something of a disappointment. It was like the ace pitcher on your favorite baseball team throwing two straight no-hit games but only a shutout in his next start. Once you see what someone’s capable of, it’s hard to see them achieve anything less than that. This brings us to A Black Mile To The Surface, Manchester’s first new material in more than three years, and the first with yet another retooled lineup—multi-instrumentalist Chris Freeman parted ways with the group last year, reducing them to a four-piece consisting of Hull, longtime guitarist Robert McDowell, bassist Andy Prince and drummer Tim Very. The album is a direct shift away from Cope’s heavy reliance on crunchy guitars and straightforward song structures, though it still isn’t afraid to rock (“The Wolf,” “The Gold”). Surface instead includes some jammier guitar-rock elements more common with a band like My Morning Jacket (“The Grocery”) while loading up on production tricks that make headphone listening not just a suggestion but a requirement: There is dialogue buried deep in the mix, hidden layers of piano tracks, and vocal harmonies with heavy reverb are stacked high, yet none of it ever feels over the top or in danger of crumbling under the weight of its self-assigned grandiosity. Hull’s original idea for Surface was to create a concept around a pair of feuding brothers living in the real-life mining town of Lead, South Dakota. He later scrapped the idea but many details remain, including the sinister-sounding “Lead, SD,” the only track on the album without a definite article in its title, which serves almost as a hub for the whole record, mentioning characters and locations that pop up in other tracks. A lyric sheet would come in handy while listening but it’s not required to gain deep enjoyment from the subdued, folksy “The Alien” which segues expertly into its epilogue, “The Sunshine,” or from “The Moth,” which carries with it a vibe akin to those rare moments when modern-day Radiohead decides to write a hook. Truly, the only gaffe on Surface comes in the form of “The Mistake,” which legitimately sounds like Billy Joel’s “Movin’ Out (Anthony’s Song)”—it’s in the same key and everything. Given Manchester’s propensity for some seriously unusual cover songs in the past (No Doubt’s “Don’t Speak; Rupert Holmes’ “Escape (The Pina Colada Song); and The Fresh Prince Of Bel-Air theme song among them), one almost has to assume that this was an intentional decision, which makes it all the more quizzical. But beyond that, A Black Mile To The Surface does not disappoint. It may not be a no-hitter (nothing here is as immediately visceral as, say, “Shake It Off” or as instantly gorgeous as “Simple Math,” perhaps), but the band still looks and sounds strong. There’s no need to send Manchester Orchestra down to the minors yet.